The words are stuck on the tip of my tongue, a little shy from my fingers that are dancing on the keyboard. It is there, somewhere, hidden like the ingredient in a cake that you can’t place, but somehow you know it is something that makes the cake so different, so unique. I try harder. I believe in trying, I believe that behind every greatness there are hundreds of hours of bawling, melt-downs or just plain banging-your-head-to-the-wall kind of activity. Which is what I feel like doing right now, hitting the same buttons over and over again, putting words with words, only to press backspace with such force my finger feels bruised. If you’re still here, listening, thank you. I hope I do not turn you away from this ranting and rambling, because what comes next is good. Really good. 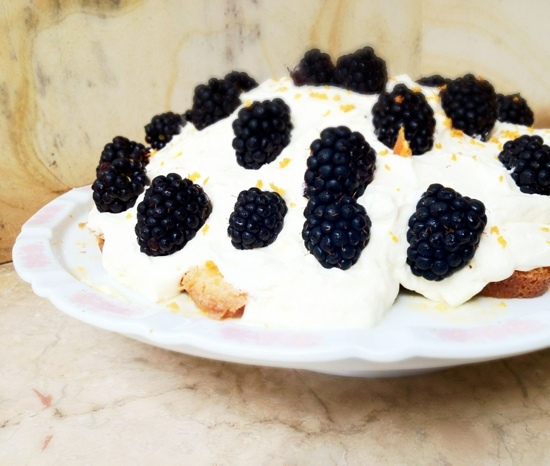 This deconstructed lemon-blackberry trifle to me, feels like a rainbow after a storm. It feels like a rush of words coming beautifully, dancing and laced by a delicate pink ribbon, after hours of punching the keyboards madly. It is so easy, a no brainer and it is both alluring and comforting. It might as well be called assembling rather than baking. You cut a lemon loaf in half and slice it thinly. Arrange the slices in a platter, soak them with a mixture of sweet and dashing apricot marmalade that has been swimming in orange juice. Get the heavy cream, chilled as the first breath of winter. 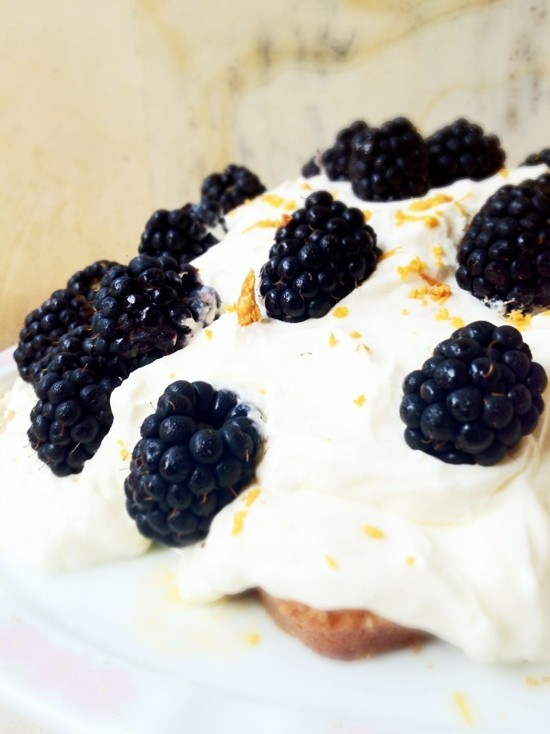 Whip it and once the pure white liquid turn into fluffy cloud of goodness, Spoon carefully on top of the soaked loaf then bring out the blackberries. I like the way sometimes the little black pearl would puff out and smear my fingers purple. Funny how it looks like midnight, named black, but leaves a soft, violet hue. Arrange the proud, bouncy berries on top of the cream. Sprinkle with little speckle of orange zest. Cut it, eat it, share it and be merry. This trifle taste like a light, fluffy sweet pudding. I made it for my cousin baby shower. I’ve been told by my Aunt ( who has been who complaining she couldn’t find the trifle in the morning) that the lovely couple and their friends inhaled it in one serving. This is more of a guide then a recipe. It all depends on your choice of the platter. I chose a circle platter with a 9 inch diameter, so if your presentation vehicle is either bigger or smaller than this, feel free to adapt accordingly. Slice the loaf with a serrated knife about 1 inch thick. Arrange it on your choice of platter. If it is round like mine, put one slice in the middle and circle the rest of the slices around it so the center will not be hollow. In a small bowl, combine the apricot marmalade with the juice from the orange. Whisk slightly, breaking the pulps. Spoon the juice over the slices, making sure each of them is soak through. Drop the whipped cream on top of the slices, covering it. 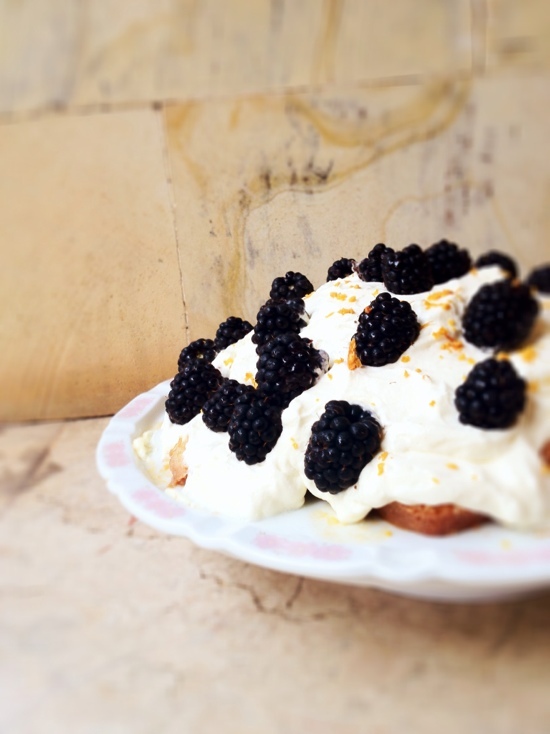 Take out the blackberries and dotted them on top of the fluffy cream. orange skin over the trifle. Gorgeous :D. Aren’t blackberries just the most wonderful berry? Oh, I definitely agree with you there. I don’t even want to think about how many baking disasters it’s taken to get me to semi-decent in the kitchen. 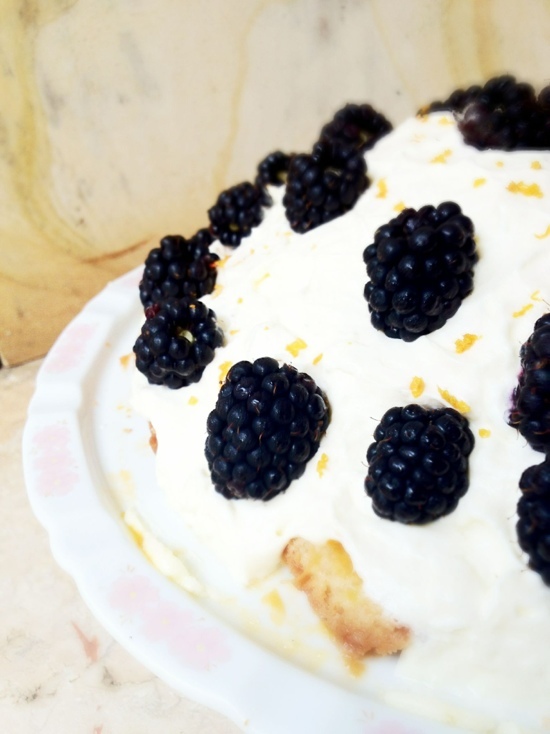 This lemon blackberry trifle looks amazing! 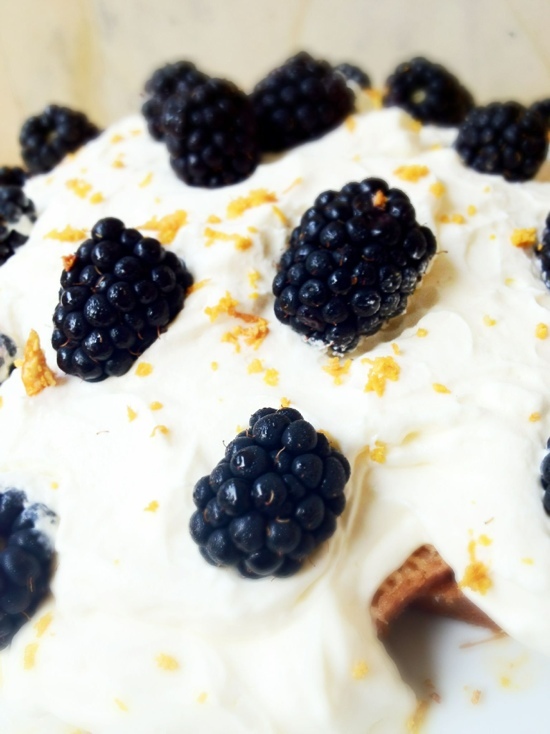 I feel like I need to bake a lemon pound cake just so I can make this! True dat. Especially the dishes we had to clean after the baking disasters… No, let’s not go there.